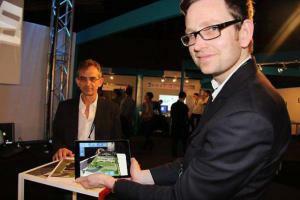 Since 1999, LAVAL VIRTUAL exhibition has been a reference in virtual technology and uses. This year ARTEFACTO’s booth stressed on augmented reality and its USES, highlighting real, useful and relevant applications in many of our clients’ activities. 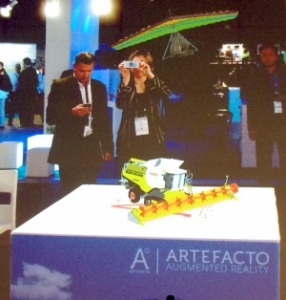 On a large screen and virtually placed in Augmented Reality on our iconic cube, we exhibited 3D models such as a combine harvester, a museum piece, D2 tower in La Défense (Paris) … . A representation of our principal sectors (industry, heritage & architecture). Contrasting with other purely technological booth, our “sector” presentation was appreciated by the public, not only it allowed to project the different uses of these technologies, but also reflected their economic viability. Finally, for those who had not met with our mascot yet, it was the chance for them to see an elephant hang gliding, and this was definitely worth the trip!